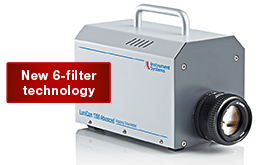 This instrument is based on an innovative concept with 6 filters. Alongside the four optical filters of the LumiCam 1300 Color (X’1, X’2, Y’, Z’), two additional filters (K’, L’) are used. In combination with an optimized algorithm, the tristimulus values are calculated much more accurately compared with previous methods.